Celebrate your Bulldog pride through service! TruCare is an international service event where the Truman community volunteers locally to make a difference globally. While Truman students serve Northeast Missouri through the Big Event, you can join a service project with an alumni chapter or club or volunteer individually for any cause important to you. TruCare is open to all alumni, family and friends of Truman. Log your service hours online, and let’s see the impact Bulldogs make during the month of March across the world! 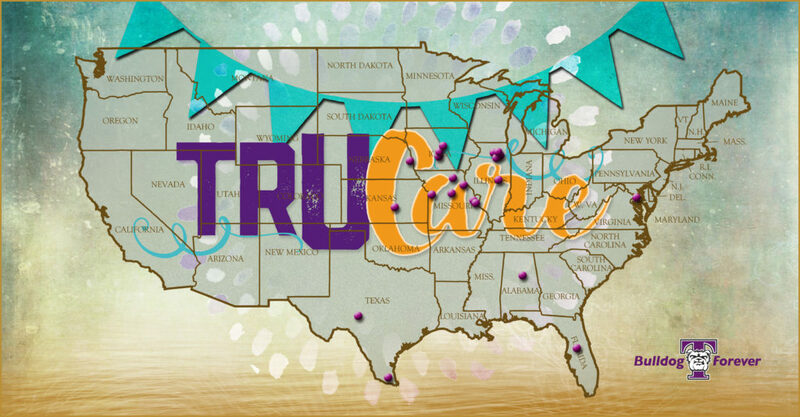 The Alumni Association invites everyone to participate in TruCare, an international event where the Truman State University community comes together to volunteer locally to show Bulldog spirit by paying it forward! What: The Alumni Association is leading an effort to engage Truman State University administration, staff, faculty, students and alumni in a National Day of Caring to “pay it forward” with good works. Who: Everyone who is a member of the Truman State University family including alumni, students, family, and friends. Where: Everywhere. We encourage everyone to find a local cause. When: Wear your Truman attire and volunteer during the month of March and record your hours. We will culminate our efforts in coordination with the Big Event, a huge one-day service event held on the Truman campus. Why: The Truman community encourages thinking globally, while acting locally to allow participants to select their own philanthropic causes in their respective community. How: Volunteer with a group or by yourself during the month of March. Keep track of your hours and submit your total number of volunteer hours to us. At the beginning of April, we will total up how much of an impact the Truman community makes by volunteering. Contact Jordan Smith, Coordinator of Alumni Relations, at 600-785-4167.